Just this week we received our certification letter from the North American Mycological Association approving the membership of The Hoosier Mushroom Society. Up until this week, Indiana was one of the 15 states that did not have a mycological association. There are now 36 states that have an association, with many more regional organizations. The goals of this organization will be the same as most of the other mushroom societies – to promote the education and research of all types of fungi. We will have information for those interested in hunting, photographing, growing, eating, or identifying mushrooms or other types of fungi. We are planning to have an organizational meeting sometime in mid-May, and would encourage any and all interested individuals to attend. Please contact us if you are interested, as we have not yet set a date for this meeting. We also have our first event scheduled for the Society. On June 5th-7th at Brown County State Park, there will be a Bioblitz occuring. This is a timed event that seeks to account for any and all living things in a natural area. One of the taxa being documented during this event are the mushrooms that are occuring during this time. We will be camping at the state park that weekend and would invite you to join us for this event! Brown County State park is a beautiful place to camp if you have never been. Kendall Morrison cultivates mushrooms in the Secret Garden in Brooklyn. You might not be able to tell right away what Mr. Morrison is doing. He may be wielding a hand drill, for instance, boring holes into a salvaged oak log. Or he may be pounding inchlong dowels into the wood with a mallet, each little peg impregnated with shiitake mushroom spawn. 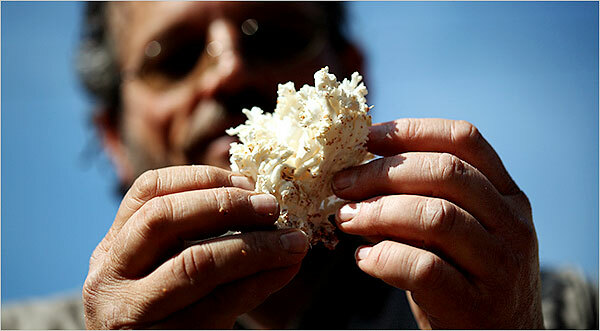 If small-scale mushrooming is indeed a movement, Mr. Morrison seems to have a growing number of comrades nationwide. We have seen a very similar interest in our retail store. Our five varieties of plug spawn are some of the best sellers online and in the retail environment where most of the visitors didn’t even know it was possible to easily grow mushrooms at home. Usually, if we are able to explain to someone how easy the process is, they are very interested and would like to try it out themselves. Take a couple of minutes to read the full New York Times Article. It is a worthwhile read. Tom Volk, a prominent mycologist from Wisconsin, is looking for some help with his research. He needs help from mushroomers collecting samples of Urnula craterium – The Black Tuplip fungus, also commonly called the Devil’s Urn. Wish I would have seen his request for help a day earlier. I had just photographed several out in the woods. the spring,…… usually along the undersides of downed logs. Went out last night for an hour or so to see if any morels are popping up on our land. We weren’t able to find any morels yet, but we did find several other species of fungi that are common in the spring. They are Scarlet Cups and Pheasant Backs. Some samples of the Scarlet Cups were brought into the store for the “Whats in the Woods?” section. Often times these mushrooms first appear in the woods slightly before the morels do. We are hearing that some people are finding a few morels in the area, but not in any great numbers yet. These Scarlet Cups were found in a ravine near a small creek. Only one mushroom was initially visible at the surface, but brushing back some leaves revealed a great number. Most were solitary on the partially buried sticks, but there was one cluster of 4 mushrooms. The Pheasant Backs – which some call Dryad’s Saddle – were still very immature, so we left them to grow a bit longer. We will go back to the spot every night and take some pictures of the growth. It is only a short walk from our house, so it should make a nice set of pictures over the next week or two. Most books make reference to these Pheasant Backs growing on dead elms. Scientific Name: Sarcoscypha dudleyi or Sarcoscypha austriaca depending on spores. Sarcoscypha coccinea on the West Coast. Edibility: Said to be Edible. Fruitbody: 2-4 cm (2-6 cm) once mature. Bright red cup-shaped surface. Small white/clear hairs on surface under magnification. Underside of the fruitbody is white. Flesh is thin but not brittle. Stalks: Absent or up to 2 cm. References mentions up to 3-4cm. Habitat: This specimen was found on the base of a hillside on partially buried wood. Near a creek in a ravine. One reference makes a mention that these are found near wet places. Spores: From MushroomExpert.com: Sarcoscypha dudleyi: Spores 25-33 x 12-14 µ; elliptical, with rounded ends; typically with several to many oil droplets; when fresh, entirely sheathed. Sarcoscypha austriaca: Spores 29-36 x 12-15 µ; elliptical, with slightly flattened ends; typically with several to many oil droplets; when fresh not entirely sheathed, but with small “polar caps” sheathing each end. Lookalikes: S. occidentalis – Occurs later in the spring, has a smaller cup, and a well developed stalk. Journal Notes: One mushroom was slightly showing through the leaves with its bright red color. Moving nearby leaves found another 5 or 6 more between 2 other partially buried sticks. One cluster of 4 and 2 solitary mushrooms on one 14” stick; 3 solitary on another.